Yes, two days into the official spring season and Portland, Oregon was blessed with another small snowstorm, dropping 1- 3 inches all around town. As with all the other light dustings earlier this month, the snow was brief but beautiful. It snowed just enough to make a good size snowperson and to also cover the plants and houses with a fluffy blanket of the white stuff. Even as we wait for spring with bated breath, it is worth it to say goodbye to winter with fond memories, so I snapped a few pictures. 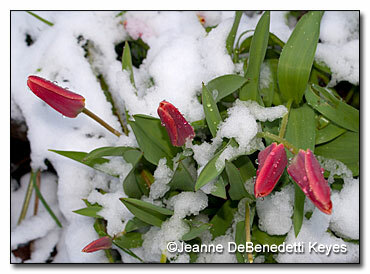 I love how the clear red of these tulips, possibly Tulipa ‘Red Ridinghood’, shine against the pure white of the snow. 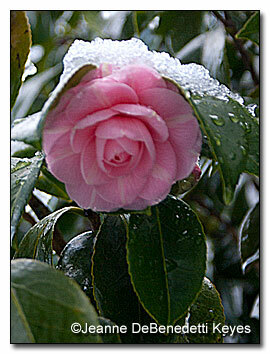 Look at this sweet, little, pink rosette of a camellia. The snow makes it look like frosting on a birthday cake. 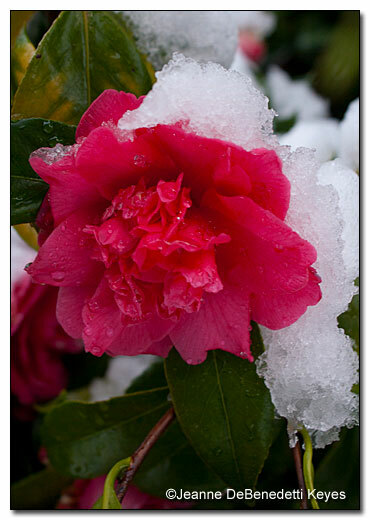 I don’t know the names of many of the camellias around my property, but I sure do enjoy them. Now I wish I had stopped to take a few more pictures. Jeanne is a geographer by training and trade, but she always had an interest in ecosystems, forest and plant habitats. Her gardens at home reflect a love of Pacific Northwest natives, Asian shade plants, such as Arisaema, and the grouping and collecting of plants by geographic region. 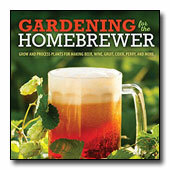 As a freelance writer and a hobbyist gardener with ten years of experience working her garden, she enjoys touring gardens, and discussing and writing about plants.